Maybe you want to go out to a nice dinner with your family? Or to a movie? A Play? Winning this $100 will be just what you need to help you have that fun. Disclaimer: The Stuff of Success is not responsible for the awarding of the prize. 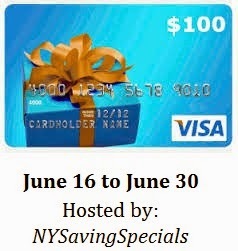 If you have any questions about this giveaway, please email the host at nysavingspecials@gmail.com This blog, Facebook, Twitter or any other social media network is not associated with this giveaway.